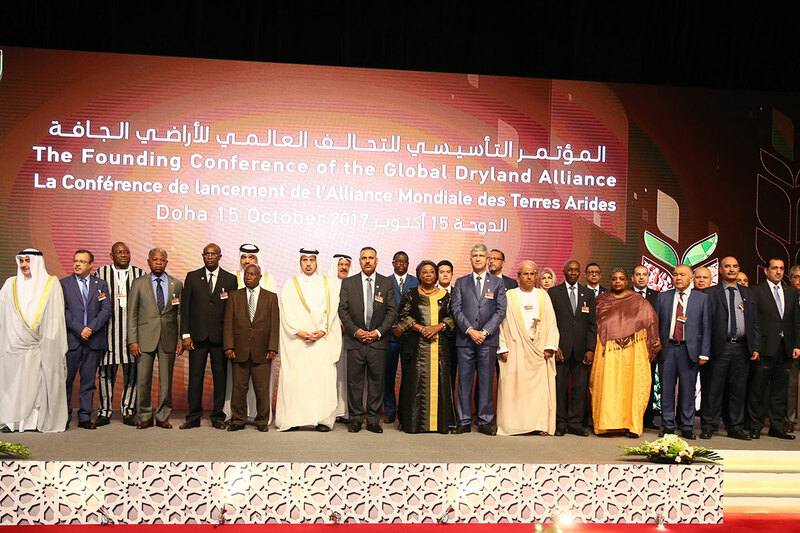 Under the auspices of His Highness Sheikh Tamim bin Hamad Al Thani, the Emir of the State of Qatar, hosted the Global Dryland Alliance (GDA) Founding Conference from October 14-16, 2017 at the Sheraton Doha. Delegations joining from 25 countries and international organizations from the Middle East, North Africa, Sahel, Central Africa, Central and East Asia, and South America attended the conference. The conference has witnessed the signing of the foundation treaty of the new organization which will be headquartered in Doha. The Global Dryland Alliance is an initiative by His Highness Sheikh Tamim bin Hamad Al Thani, the Emir of the State of Qatar to establish an international organization to face food insecurity consequences, negative environmental and economic impacts associated with climate change. The Global Dryland Alliance (GDA) aims to be an international organization to combat food insecurity and to develop solutions for shared food security problems and exchange expertise in times of crises. The Alliance aims to work with local, regional, and international partners to identify, disseminate, and implement solutions for agricultural, water, and energy challenges of dryland countries. GDA will promote partnerships with the public and private sector to fund and implement programs and projects of the Member States different fields related to food security. Drylands have become a critical issue given their space in the globe. Under the United Nations classification, drylands exist in 51 countries which are home to almost 3 billion people, a third of the world’s population. During the 2010 Millennium Development Goals Review Summit, the UN General Assembly has expressed its concern about lack of progress in regards to eradication of poverty and hunger in dryland countries where half of the world’s hungry and poor live. Through cooperation with countries and organizations committed to ensure food security for drylands’ inhabitants, GDA will work to fill the gaps between research and food security policies to help dryland countries enhance their food security and access reliable resources of food, water, energy, seeds, and fertilizers. Copyright © 2019 GDA. All rights reserved.